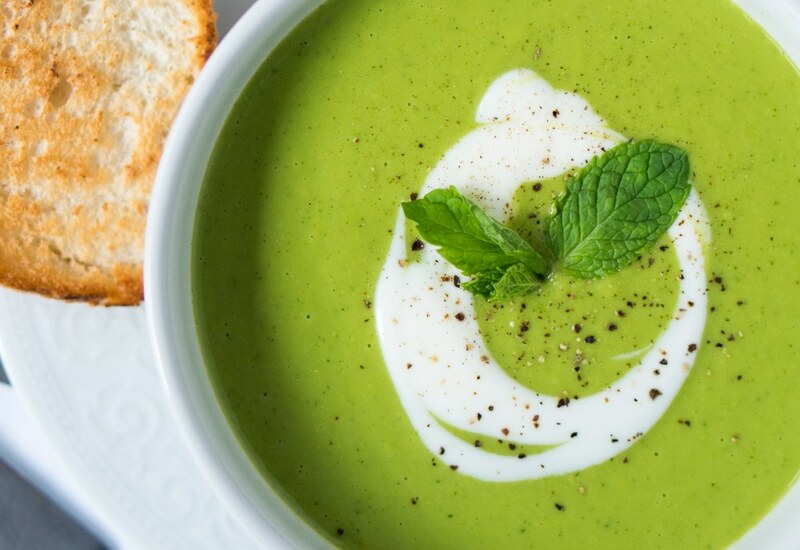 This 30-minute recipe delivers a delightful pea soup with a refreshing hint of mint. It is an elegant way to sit down to a beautiful spring meal. Onion is sauteed in butter and then a plethora of fresh peas are added. It is cooked in vegetable broth until the peas are tender. The soup is blended along with fresh mint leaves and seasoned with salt and pepper. It is thickened with a dash of buttermilk and served with an elegant swirl of sour cream. Garnish with a few turns of black pepper and additional fresh mint. To make this soup vegan, use olive oil instead of butter and coconut milk instead of buttermilk. It tastes just as good because the beautiful flavor of fresh peas is the star! Per Serving: 280 calories; 10g fat; 36.5g carbohydrates; 12g protein; 26mg cholesterol; 613mg sodium. I was a bit skeptical of this, but it turned out really nice. I love peas, mint, and creamy soups. Never thought they'd all come together like this, though. Made this as an appetizer for a friend who is vegan. Just subbed the buttermilk for coconut milk and she really enjoyed this one. I really liked the mint that came through. I put sour cream on mine and it was much needed on my end. I added diced, thick cut ham pieces in this pea soup. I also used a chicken broth instead of veggie broth. I really like the flavors, perfect for spring. Used olive oil instead of butter and coconut milk instead of buttermilk. Not a vegan, but really love those flavors together. Perfect spinach dish, especially with sour cream, salt and pepper. Served this up with a nice, thick crusty piece of bread. The buttermilk gave it a nice, thick texture too. It's good with or without the sour cream.